Need a recipe for a tasty sweet snack? 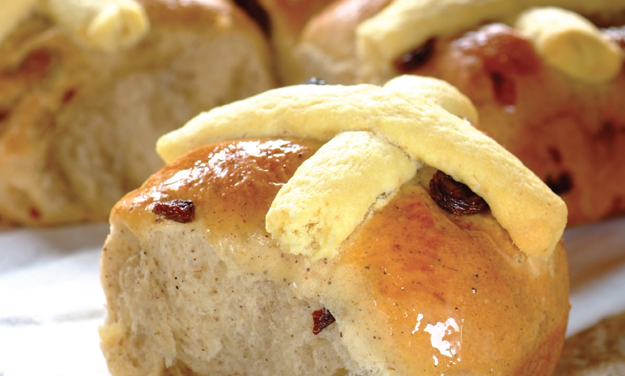 Try this hot cross buns recipe for a delicious baked treat today. Stork – love to bake. Sift flour, salt and spices. Rub in Stork Bake until mixture resembles fine breadcrumbs, then add sugar, yeast and fruit. Add egg and milk to the flour mixture to form a soft dough. Knead for 5 minutes. Cover with a damp cloth and leave in warm place to rise to double its size. Turn onto a floured board and knead lightly. Divide into equal portions and with your fingers, form each into a bun. Place on a greased tray. Cover and allow to rise for 20 - 30 minutes in a warm place. Brush with a little beaten egg and pipe a cross on the top. Bake in a hot oven at 220°C for 10 - 15 minutes or until nicely browned. Rub Stork Bake into flour and baking powder. Add milk to form a paste. Mix well until smooth. Place into a plastic sandwich bag. Push to one corner to form a piping bag. Snip the end with a pair of scissors.